The grass is always greener on the other side. I think this is very true as my food adventures totally reflect this. Even though I stay just 10 minutes away from Bukit Timah, I tend to go further in search of good food in Singapore. Come to think of it, I have never really explore the stretch of restaurants at Cheong Chin Nam road (directly opposite Beauty World). As I was walking along there last week, I realized that there’s actually quite a few eateries that open till late night, and they are now officially my prime-targets for supper. The chicken rice craving gave us the choice between Five Star Hainanese Chicken Rice and Boon Tong Kee since both of them are arguably famous chicken rice in Singapore. There were mixed reactions on twitter when I asked which is the better chicken rice among the two, and we eventually went for Five Star since I had Boon Tong Kee chicken rice before. Sinking your teeth into the Five Star Kampong chicken ($14 for half, and $28 for whole)… It was actually quite ordinary. But there’s this lingering after-taste which I found it hard to explain. As the teeth made contact with the chicken, it encountered first the roasted skin, then a layer of fat which disintegrated as your teeth moved on to the juicy chicken meat. Was this the best chicken rice in Singapore? Probably not. Was it good enough? Yes. DO NOT ORDER the Hainanese Pork Chops ($7)! You have been warned. I LOVE Sweet and sour pork ($9). I can have it for dinner everyday and not get sick of it. After ordering half a chicken and the Hainanese pork chops, you would probably think that we won’t order any more meat. But I demanded to order the sweet and sour pork and it was surprisingly not too bad. Five Star Hainanese Chicken rice’s rendition of my favorite dish was definitely not the best, but it was actually much better than the usual ones that I had before. 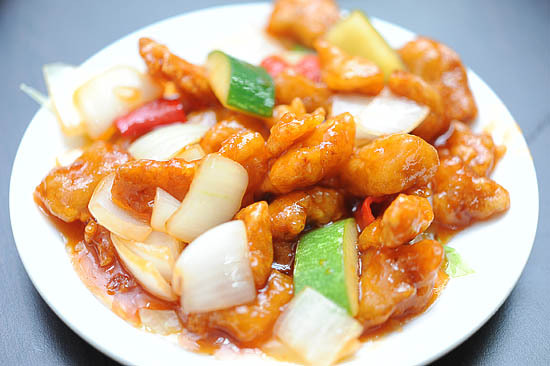 The meat retained the slightly crispy texture despite being drizzled with the sweet and sour sauce. Not too bad, not too bad at all. We can probably also classify Boon Tong Kee and Five Star Hainanese Chicken Rice under zi char stalls since both restaurants serve a good variety of Chinese food in the zi char style. Have you tried both Boon Tong Kee and 5 Star Hainanese chicken rice before? Do share with us which one you preferred. Imo, there’s nothing special about Boon Tong Kee…I don’t find it really good. Five star for me! Plus, the rice there is a lot more fragrant to me than Boon Tong Kee’s. Boon Tong Kee has good fried tofu though! Check it out the next time you go there. wow…i love that chicken dish. looks fab! Boon Tong Kee was a horrifying experience. Bought a drumstick rice and found that the skin is just too slick and the meat too soft to bite. 5 star does nothing for me. Prefer Tian Tian else Chatterbox. Have you tried Nam Kee chicken rice at Upper Thomson road. The place is kinda old but the white chicken rice (and some of the side dishes), absolutely delectable. daphne: nan kee at upper thomson is different from wee nan kee at novena right? are they related or something? Do try TONG FONG FATT chicken rice @ either ABC market or parkway’s hawker centre. Boon Tong Kee is only worth it at the Balestier branch IMO, the quality at their branches are a far cry.